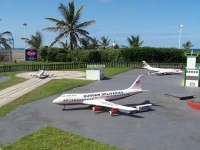 This knee-high miniature replica of Durban makes a great outing for families and kids of all ages. Located on Durban's beachfront, Mini Town is a popular and well-loved tourist attraction for kids and adults alike. It features moving models of planes and trains, a circus complete with animals, a movable bridge which makes way for passing ships, several of Durban's landmark buildings, and a tug boat that makes its way around its very own miniature dock. All models and buildings have been created on a 1:24 scale. Mini Town was established more than 30 years ago and although it is very well-maintained it has retained a charming, old-fashioned appeal. There is a small restaurant kiosk where snacks and refreshments can be purchased. Mini Town is owned by the Quadriplegic Association of KwaZulu-Natal and is used as a method of raising funds for their organisation while providing employment for some of their members. It is therefore a worthwhile tourist attraction to support. It is located on a main bus line, and is within easy walking distance of Suncoast Casino and many popular beachfront hotels.